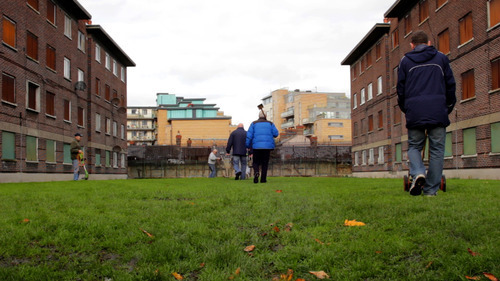 There is one way in and one way out of St Teresa’s Gardens, a flat complex in Dublin’s south inner city, a community that missed out on the large-scale regeneration it was promised, being left instead with a ghost town. Maud Hendricks, working as a collaborative artist within the community, creates a series of film portraits of local people against the background of an estate on the brink of demolition. This is no ordinary documentary film but rather a piece of work where the boundaries of the theatrical and the real are tested. We hear the voices of the residents, although their identity is never revealed. Orchards, picnics, foxes, names of children who played there, lawnmowers in motion, wall painters, a beauty contest, a game called ‘love hate’, stories of recovery, finches and other feathered friends, boxing, balconies, front doors, friendly faces old and young and much more grace the screen, revealing a closely knit community that will soon be scattered across Dublin. If these walls could talk!